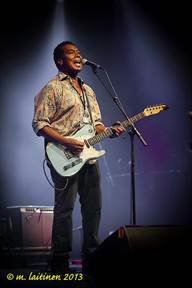 “...left-of-center/eclectic blues...a monster blues guitarist/singer with an amazing sum of influences: North Mississippi drone blues-meets Jimi/BB/Albert/Curtis Mayfield/Marley filtered-through-Haight Ashbury..."
The son of a Filipino mother and an African-American father, Jack was born in the Philippines. He grew up in the Haight-Ashbury district of San Francisco. His mother bought him an acoustic guitar at the age of twelve because she wanted to keep him busy. The family moved to Denver, where he learned to play music by ear, playing music by everyone from Hendrix to Dylan, unaware that he was learning the foundation of American music – the blues.